March 31, 2017. Come home to Cambodia! We had our last buffet breakfast in the hotel and prepared for check out. We went to the swimming pool at the roof deck and had a quick photoshoot until around 10am. The cityscape was a perfect background for the shoot! I really thought though that the view was better at night. We left the hotel at 11am and reached Dong Meung Airport at 12nn. 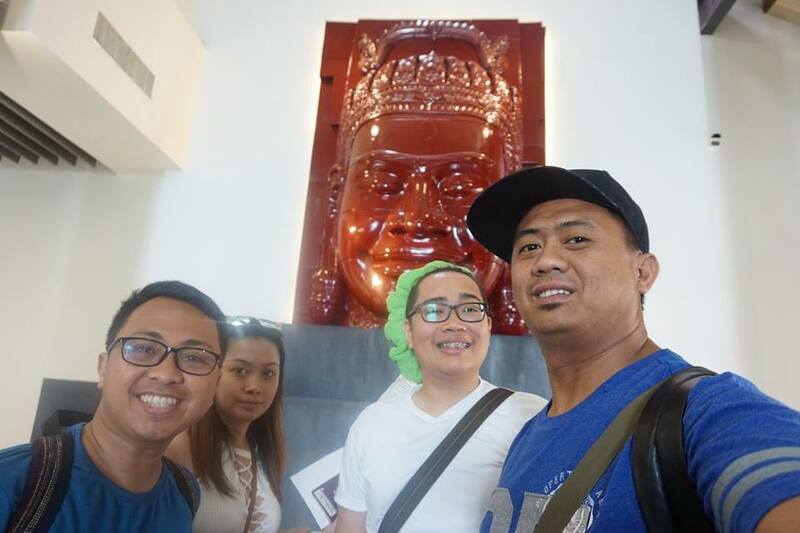 We left for Siem Reap via AirAsia at 150pm and landed in Siem Reap Airport in Camboadia at 230pm. Siem Reap Airport was a lot smaller and simpler compared to the that of Thailand’s. 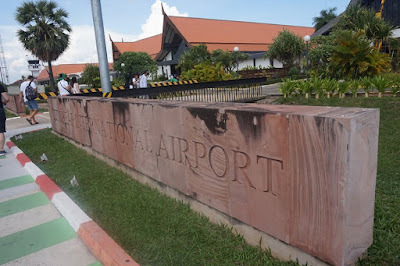 If you’ve been to Aklan Airport, it’s quite similar to that except that Siem Reap Airport was a lot cleaner. 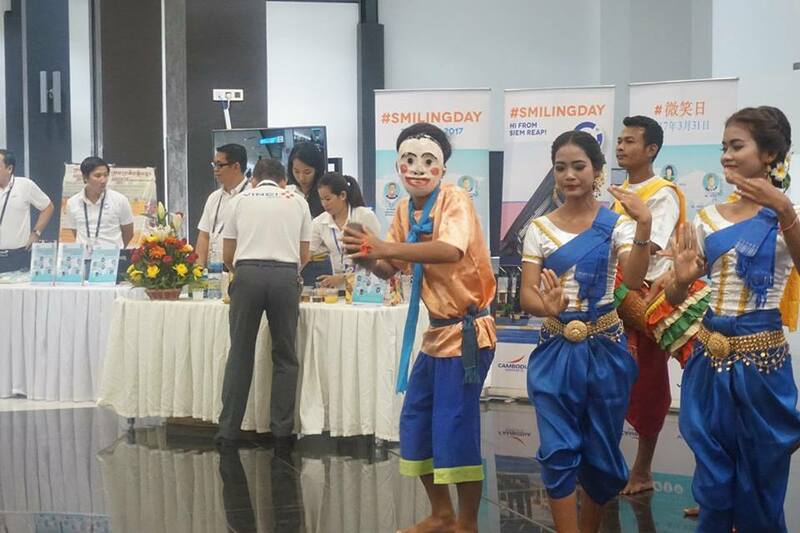 Upon arrival, we were greeted with welcome drinks since it was #SmilingDay. 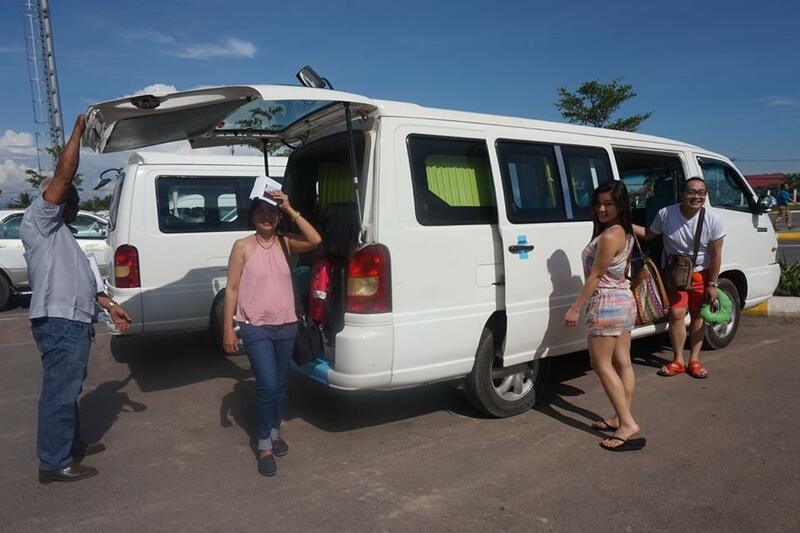 From the airport, we were transported by the hotel shuttle to Royal Crown Hotel. The scenery was very different from Bangkok’s. 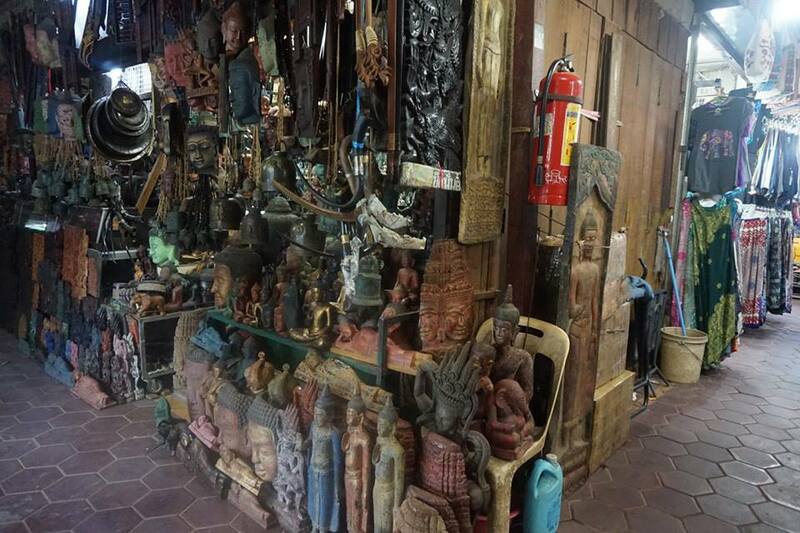 Siem Reap reminded me of the provinces I visited in the Philippines. Their tuktuk looked different as well compared to Thailand’s tuktuk. 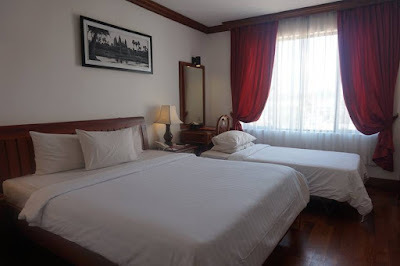 Upon reaching Royal Crown Hotel, we were welcomed by the polite and helpful hotel crew, who were mostly males. From them, we learned the words “susaday” (hello) and “akun” (thank you). 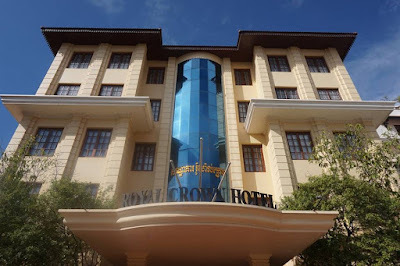 Royal Crown Hotel was a clean and comfortable hotel, as well, so we rested until around 5pm. Moreover, the hotel was conveniently located near the market. Thus, after having our afternoon rest, we went to the night market! The night market was very organized as the stores were zoned according to the products that were being sold – clothes, home decorations, art pieces, and paintings, among others. 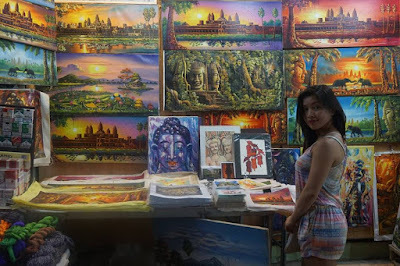 I bought a painting of a family of elephants on white canvas for 200 baht. 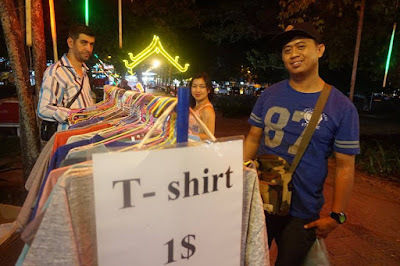 We also bought clothes for $1 each from a Turkish guy selling along the street! It’s a good deal already since the same clothes were being sold at $2 or higher inside the market! I bought four items which I would give as pasalubong. 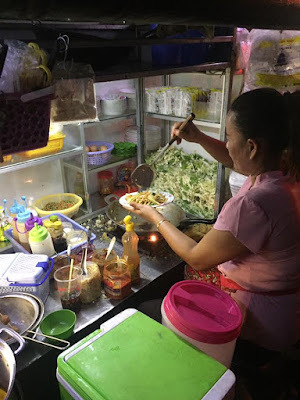 Finally, we had our street food dinner composed of fried noodles, spring rolls, and fried rice, for only $1 per serving! That’s how to eat on a budget! April 1, 2017. The Temple Run. It’s April Fool’s Day but for us, it’s Temple Run Day as we were about to explore Angkor Wat (“Capital Temple”)! Back in high school, we just read about this Temple, considered as the largest religious monument in the world. 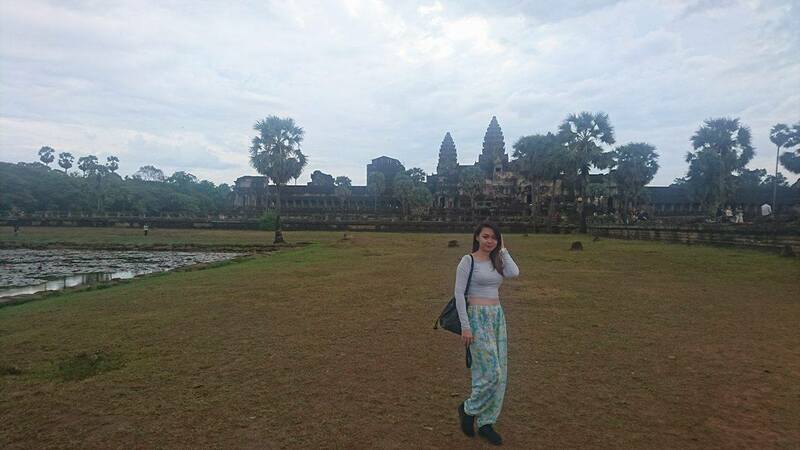 Angkor Wat, is Cambodia’s most famous symbol, appearing in its flag and its primary tourist attraction. We woke up at around 5am because we want to witness the sunrise in Angkor Wat. 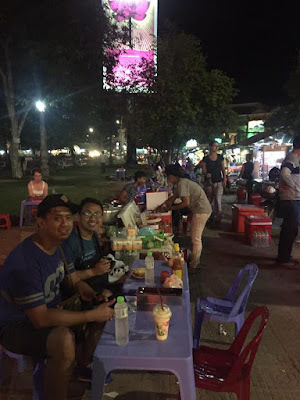 The night before, we already asked the hotel to have our breakfast packed since we would just eat along the road. To our surprise, the stryropack only contained breads, butter and jam! 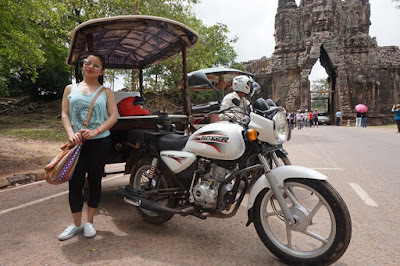 We waited outside Angkor Wat complex, hoping for the sun to come out. It took an hour or more, but we did not see the sun rising! It was April Fool’s Day, indeed! Worse, it started to drizzle and we did not bring any umbrella! Since the sun did not show up...we just had fun! We decided to just proceed with the tour of the temples. We were amazed both by the ruins, the architecture, and the whole story that went with all the stones in the temple. Who's got the best pose? We met Cambodian kids and and adults who spoke Tagalog! According to them, their teachers were Filipinos and they were the ones teaching them the language. 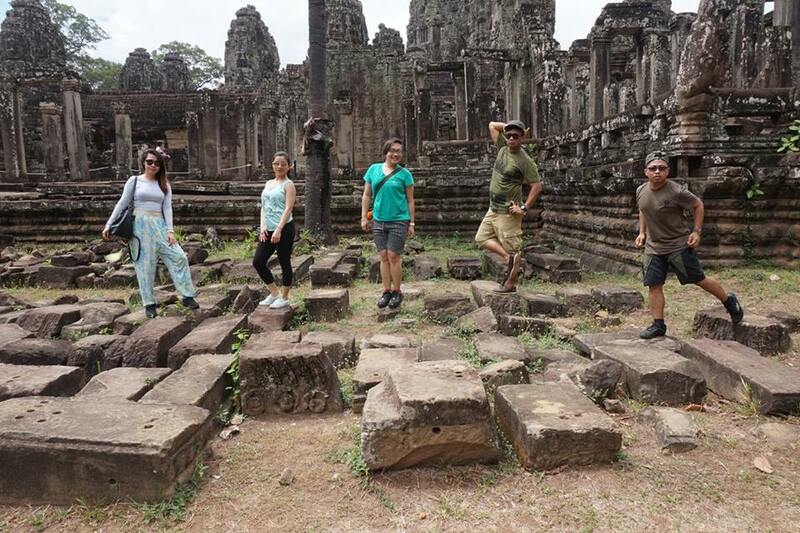 Well, it was working for them since there were many Filipino tourists in Cambodia! 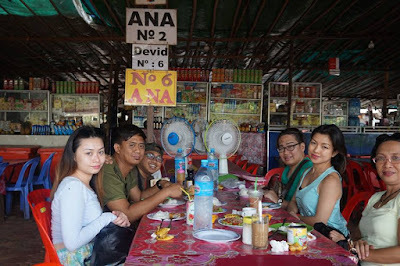 We bought souvenir items from them and even had our brunch in one of the eateries owned by Ana (the lady who helped us took good photos and taught us how to utilize the panoramic option in our cameras!) The foods were quite pricey. For example, the fried rice cost $5, which could be bought for only $1 outside (where we ate the night before). Also, one of our realizations in this trip was that drinking water was very important! They did not have house water, so one needed to buy bottled water every time! 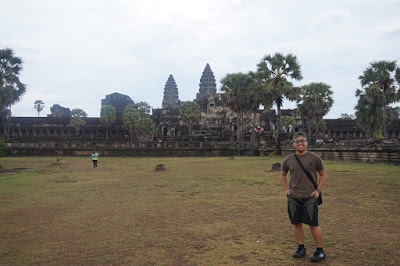 Apart from Angkor Wat, we also visited other nearby temples and Tomb Raider’s tree. 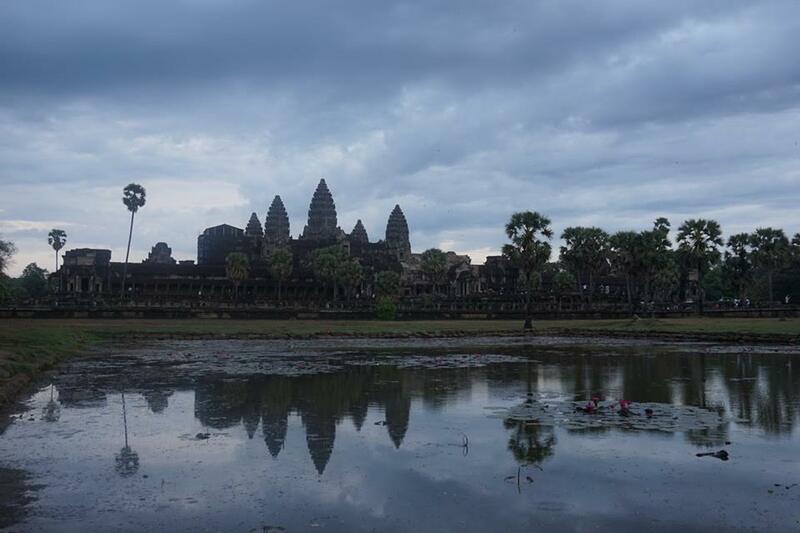 If you’re the type of tourist who love temples and ruins, Cambodia is the place to be. However, if you want variety, you might want to consider other destinations as the temples were quite similar from each other. We went home and took a dip in the hotel’s swimming pool. By 10pm we needed to check out as we were leaving for our next destination: Vietnam! 1.) What is your best experience in Cambodia? 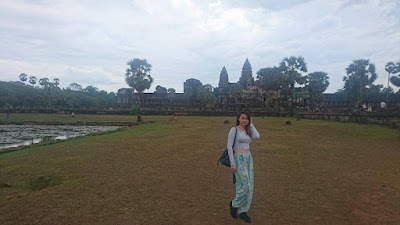 The best experience that I had was visiting Angkor Wat. It felt surreal. I only read and saw picture of in history books before and now I got the chance to be there. I see perfection in the ruins. I also love our experience travelling in a sleeper bus. I wish we had that in the Philippines! 2.) 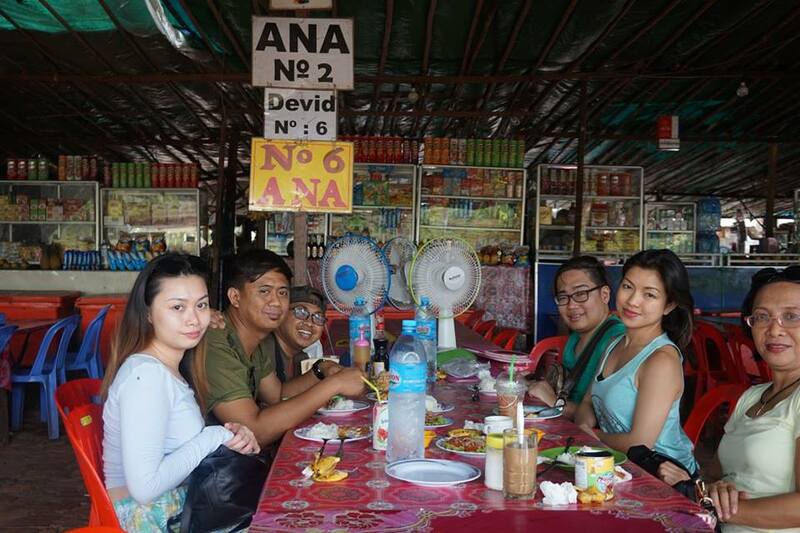 What is your worst experience in Cambodia? Aside from the language barrier, everything was fine. Locals were friendly and accommodating. 3.) 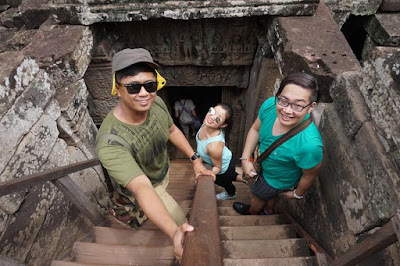 What is your tip to first time visitors of Cambodia? My tip would be this: if you are visiting Asian countries, be a local. Act and look like one because it is an advantage! It is always the best to travel with your “bestest” friends! I want us to travel in Japan. I’ve been there before and I had a wonderful experience, so I want it to experience it with my best friends. This time, I want us to travel in Osaka and Kyoto. You’ll experience the old and true Japan in those cities.